The Life of Bon: Our first year of marriage: The truth. In March Greg and I will celebrate three years of marriage. To us it feels like we've finished a damn marathon. Marriage has worked us into the ground, it has pushed us to our physical and emotional limits, we've wanted desperately to quit at times. It's been extremely trying, but in the same breath, unimaginably rewarding. After three years we feel like we have accomplished quite the feat. We are, after all, still alive. On paper, Greg and I seem like we would have no problems in a marriage. We are the same race, from the same county, practicing same religion. We studied similar subjects in college (Theatre and English) and we have disgustingly similar senses of humor. We are both middle class raised by two parents in Utah. So adjusting to married life should be relatively easy, right? I have heard other people say that the first year of marriage was tough for them, too. How tough- I have no idea- I have only seen the inside of my own marriage. For me, this is one of the most difficult things about marriage. There is nothing to compare it to, no benchmark to make sure we are all doing okay. Is this how often "normal couples" fight? How often "normal couples" go out? What "normal couples" talk about? Is my marriage healthy or unhealthy? It's a marriage- that's about all I know for sure. Greg and I have come a long way, and it is only after a couple of years and lots on introspection that I am even able to write about our sometimes tumultuous first year of marriage. I write about this for a couple of reasons- I want my children to have a better understanding of their parents and to understand the struggles and conflicts that we went through. I want them to know we fought tooth and nail for our family. Secondly, I want to be honest and truthful to readers who may have experienced or may be currently experiencing similar conflicts in relationships. It seems kind of dumb for Greg and I to have worked so hard only to use the information to benefit for ourselves. And so, in a post shining plenty of light on our faults and flaws, I will share with you not only our struggles and disagreements that first year, but how we worked through them. Conflict #1: Greg is an introvert, I am an extrovert. When we were dating, this hardly mattered as we were so intoxicated with each other that it didn't much matter how we spent our free time. Honestly, we spent a lot of time making out. We couldn't have cared less who else was around. We were also on our best behavior, always anxious to please the other. 3D action movie that I have zero desire to see? You bet! Dinner with your entire 85 members of your extended family? I'd love to! I never realized that when we were together Greg was expending energy, and that he used our time apart to recharge. An extrovert like myself gets energy from being around people- I assumed it was the same for Greg. When we got married I was shocked (and hurt) that he would rather sit home on a Friday night and watch a movie than go out with a crowd. I was bugged that he didn't want to go to dance parties; he was upset that cuddling on the couch with him wasn't enough for me. I still remember six or seven months into our marriage a Halloween argument. After a long day of school, work, and rehearsal I was desperately trying to convince Greg to dress up and go to a costume party with me. He begged to stay home and watch a scary movie and pop popcorn instead. I wouldn't budge. We were going out, dang it! Exasperated, Greg shouted out, "Bonnie! I don't like parties!" I remember feeling total confusion- who was this man? "WHAT?! YOU ALWAYS WENT TO PARTIES WITH ME WHEN WE WERE DATING!" "Because I was trying to impress you! But I don't like them!" It was a revelation to me, and not the good kind. If I had my way we would party hard all weekend long every weekend. If Greg had his way we'd nap and watch Netflix and never leave the apartment. I can't tell you how many arguments we have had that have in some way stemmed from the introvert/extrovert issue. Greg is always willing to do an extroverted activity with me IF I give him enough time to mentally prepare for it. If I want dinner with a group of friends on Sunday I need to tell him by Wednesday or Thursday. I have learned to always give him a few days of "prep". If it's a big thing, like a week at my family cabin, I tell him as soon as possible- two or three months in advance. When the event comes Greg has stored up the mental energy to handle the event. It is when I spring stuff on him last minute that the argument and hurt feelings start up. Greg has also learned that there are certain times I am more likely to be high energy and to give me "prep time" as well. If he has play rehearsal all day Saturday he will often tell me, "Tonight when I get home I am just going to want to hang out with you and watch a movie. I would love for you to do something more high energy this afternoon with your friends or sisters so that you don't feel cooped up and are okay with staying home with me tonight." I think this will be a constant struggle throughout our marriage, but it gets easier all the time. Conflict #2: Money money money. Greg and I have very different views on money. In short, I am a saver, he's a spender. He likes to have a good time and live for today- if we can pay for a movie why not go to it?! I am the total opposite- we just got a check for $900, how dare you buy a $4 burger?! Greg could lose $50 and never notice. If someone owes me $2.50, I never forget. So many of our first arguments were over me stressing about money, and Greg frustrated that I was sucking the fun out of everything. We'd go to a restaurant and I'd frown disapprovingly at his expensive entree choice. I would badger him, "You went to Wendy's again?" when he'd walk in with fast food. I'd insist he didn't really need new jeans- he got a new pair last year. I got bothered by Greg's total lack of interest in money- spreadsheets, budgets, credit cards, interest rates had absolutely no appeal to him. He couldn't handle the constant nagging. "Don't you want to know how much money we've saved this month?" I'd ask excitedly. "Not really, Bon Bon, but do you want to go to Olive Garden tonight?" Conflict #3: Not knowing how to fight fair. I'm convinced that half of the struggle in our first year of marriage was caused by not understanding how the other person dealt with conflicts. I like to get arguments over with right away so when we would have a disagreement I was right in Greg's face, demanding answers and apologies. Greg always retreated (I think this is a boy/girl thing?) and wanted space from me. This made me more mad, that he wasn't more anxious to resolve the conflict and that he would let the issue continue by not taking care of it immediately. "I don't want this going on all night! Let's resolve it right now!" I'd insist. "Bonnie, I need some space." Greg would go into the other room. I'd follow him. "No! I want to enjoy the rest of our night. Why are you acting like this?" "I'm too upset. Leave me alone." So many of our fights escalated like wildfire and before I knew what was happening a tiny disagreement about Sunday dinner turned into a full blown battle. Most of our problems that year had nothing to do with the actual "problem" but with in our dealing with the problem. How we compromise: I have gotten much better at not pushing Greg's buttons. When he gets short or snappy, I simply remove myself from the conversation and start doing something else. It's never long before he approaches me ready to talk about it. Once I learned to give Greg space in an argument everything got so much easier. Our disagreements are solved four times faster than they were before and they never escalate to the epic proportions they once did. Greg has gotten so much better about saying sorry and admitting fault. He has also gotten better about not "shutting off". I think he knows know that while I am willing to give him time in an argument, he needs to be willing to come out of his cocoon soon and talk to me. Conflict #4: Time with family. Greg and I live close to both of our families which is a huge blessing. We love being so close and feeling their support. It also brings with it some difficulties. Greg comes from a family of two children and I come from a family of eight children so the mere size of our families took a lot of getting used to. Greg's family (consisting of his parents, brother and his wife, and me and Greg) goes out to eat, stays up late watching tv and talks about dogs a lot. My family has massive family dinners and sits around a house and talks while 25 children scream in the background. Greg felt like a stranger at my family get togethers of 100 second cousins and nieces once removed. I got lonely with Greg's small family when no one wanted to play a game with me. I was offended when Greg would rather spend time with his family, he likewise when I preferred mine. How we compromise: We love each other's families now. This one I just think takes time and love. Now Greg is defensive and protective of my mom, he jokes with my brothers, he adores my nieces and nephews. I can't get enough of the crazy thing Greg's dad says, his mom couldn't be sweeter and more loving and I love hanging with his brother and wife. It just took us time to realize how great each other's families were. There were (and are) more issues, of course, but gosh, I'm exhausted reliving the first year. I learned so much those first twelve months and continue to learn every day. Marriage is the hardest thing I've ever done, but by far the most rewarding. The more time that passes in our marriage the better it gets so I take that as a good sign. I can't imagine how freaking awesome year 30 is going to be. As always, I'd love to hear your thoughts. Did you (or do you) struggle with the same issues we did? What was the hardest thing for you to adjust to in your marriage/ long term relationship? My husband and I sound a lot like you guys... I'm the extrovert, he the introvert, I'm the saver he's the slender, etc. And, we have a lot of the same struggles. We're in our first year of marriage right now and this post gave me comfort because you're right, it is HARD. Thank you! I'm so glad! It is hard, but it is so insanely worth it. LOL on the favorite thing to do is to tell you your net worth. I would be so into that. And there is something so exciting about watching numbers grow... Greg think it's more exciting to buy stuff which is crazy to me. This is amazing! What a cute way to lay out the best compromises in a marriage. Gives me hope for my (loud and uproarious) future. I love the honesty in this post! Thanks for sharing your personal experiences. In this age of social media it's so easy to look on and think that other people's lives are perfect or nearly so. My husband and I just hit the 4 year mark and I definitely agree that there was a learning curve. Things are better now not because we have ceased to disagree with each other, but because we know better how to handle it when we do. Yes! I totally agree! And that's what I was going for with this post... to show that marriage is awesome but it does take a lot of work. I don't think our culture emphasizes the work and compromise and sacrifice part of marriage enough so we're all disillusioned when we get married. Exactly! I always wonder if that's a man woman thing or if it is different in every relationship. It seems like the men always want to retreat to their caves. Congrats on six months! And yes, I think they start out small and then the more time you are together and the closer proximity you are the more you seem to notice the issues. OMG Bonnie....having been married almost 42 years, I feel like I could write a book. It is amazing to live through this thing called marriage. The lessons learned are amazing and the growth each of us experience is hard to measure. Your candidness makes us feel like it's ok to have our own individual marriage issues. Loved this! Now that is a post I would like to read! I am sure you could teach us ALL so much about the lessons you've learned a long the way! It seems to me that you and Larry have got it all figured out. Your first year of marriage sounds much like my own! And I think Greg and I must have the same personality because that sounds like all the things I do that my husband struggles with. Congrats on making it 3 years!! I do think there are couples who don't have as much conflict. My best friend and her husband are this way. I can't figure out exactly why they seem to have it "easier" but I think it's because their personalities are SO alike. They are seriously clones of each other. Sometimes I wish Greg and I were more alike on some things, but I'm grateful for the growth and sacrifice we have to make... I think it has made us both into much better people. Thank you! My hope in writing it was that many would be able to relate and identify. Totally relate with this. Thank you so much for sharing and being so open. Marriage is hard and different than I thought it would be. Compromise and communication help so much! Yes! Communication for sure- that is something I didn't even touch on but it is crucial! I can't imagine a more honest, open, and heartfelt post. I think you can gain an appreciation of the two of y'all's love based on this issue-ridden post rather than a picture-perfect, lovey-dovey 24/7 one. Thanks so much for sharing, Bonnie! I really enjoyed this. I'm not married but I live with my boyfriend of 4 years and sometimes I wonder if we are "normal" we get into fights and because the two of us are completely (me more than him) stubborn they become huge battles rather than discussing what the real issue is. It's always such a relief when others discuss the conflicts they and their partner have gone through, makes you realize that you are normal, and if you work for the relationship it will work for you. I think that's what makes marriage so difficult- you never know exactly what is "normal." I've only been in one marriage so I have nothing to compare it to! This was wonderful. YAY for 3 years of amazing compromises that lead y'all to today. Michael and I definitely have the introvert and extrovert issue like y'all. The downs of a relationships always provide a gateway to the ups. Have a great Friday. Your y'alls kill me. Come live in Utah so I can hear it every day! Thank you for posting this. I don't normally comment on blogs, but I completely resonated with this. We are coming up on 2 years of marriage and it's been hard, but like you said, so rewarding. We've had almost exactly the same difficulties as you and Greg. I'm the extrovert and my husband is the introvert. I used to feel sad for him, thinking that he didn't have friends when I was always making plans with mine. I know now, he would just rather hang out at home and read or watch a movie. We are both super stubborn and so our arguments are often heated and passionate and we've realized we need to work on that. I've learned SO much about the messy parts of who I am and how to grow in those. Isn't it mind blowing how God knows exactly what type of spouse you need to teach you about yourself - and to have someone know you completely (good and bad) and still love you. Thank you for your comment- I really appreciate it- especially knowing that you are sparse with your comments :) I like how you worded it- they are the "messy" parts for sure, but it's what teaches us so much about each other and the world we live in. What a wonderful post! Congrats for 3 years! Every year is a milestone. I honestly can't remember our first year as we are coming up on #27 in a few months. All I remember about that time is that we both worked all of the time trying to build a life together, pay a mortgage, move up in our jobs etc. We were satisfied with less, thank God, because we had almost nothing. Now we are newly empty nesters and are getting used to this phase. Yes. Marriage is built of phases, each one with its joys and challenges. It is important to enjoy and savor each one. Many blessings for many years to come. Wow! 27 years!? I would love to hear from a veteran like yourself how to do it. I'm sure there is so much more to learn especially when you throw raising kids in. Love the idea of marriage being all about phases. YES! Different expectations going into marriage definitely plays into it as well. I'm not married. In fact, I'm no where close to being married but this post inspired me. The fact that you recognize the differences in you and Greg, the fact that you are WILLING to work to find that compromise is incredible and shows how self aware you both are. Thank you for writing this. I'll put it in my arsenal for the day I get married. If it ever comes. "arsenal"- love that :) Glad you enjoyed it! oh my goodness, #3 sounds all too familiar....like that is Mike and I exactly. Wow! I am too trying to give him the space he needs and putting myself in check to not escalate something that can be solved quite easily with a little space. Great post though, very honest and relate-able! Our first year was a bit tense at first, that's because we got a puppy and we were in the process of trying to purchase our first house together. Things have eased up since then, but I've noticed that I have tendency to feel like I'm right about everything, and I get upset when my husband doesn't load the dishwasher correctly or wash the dishes in the sink. I also believe that he should always know why I'm upset. I'm still working on both of these things--trying to not be so uptight about housework, and actually asking for help when I need it, instead of waiting for him to come to that conclusion psychically. Wow- a puppy and a house in the first year? Those are definitely things that can add some stress. We are the opposite of you guys as far as wanting someone to know you're upset. Greg wants me to know how he's feeling or read why he's upset and I'm just as oblivious as can be. When I tell him I can't read his mind he replies, "you should be able to!" #1 is my husband and I to a tee! The rest are very similar (except I'm the spender, he's the saver), but we have a lot of the same issues. It's totally different than dating. You can't just give up, decide you don't like this person anymore, you have to make it work. compromise is key! Yes! So different than dating. Thank you for your honesty! I always love reading these types of posts because they give me things to think about in my long-term relationship with my boyfriend. Obviously all relationships have their problems, and even unmarried couples that live together have similar problems as the ones above, but do you think they get worse when you're actually married? Does making it official affect your relationship differently than when you were together but not married? I think they definitely intensify when you are married because you are totally merging your lives. When I was single if Greg didn't feel up to going out on Saturday night I just went out with all my roommates and had a good time. It's not like that now- my roommates all have their own spouses- Greg is essentially my social life. We never had to worry about money or future plans together because they were our individual stresses- now everything is shared so my stresses about money are now also Greg's stresses about money. I don't know if you can call it "brave" or just stupid. I often get in trouble for things I write on my blog, so I am trying hard to find the balance in writing honestly and not throwing other people under the bus in the process. It is a tricky balance. I love this, Bonnie. I don't think I ever realized how "bad" the first year or so was until I looked back. We both laugh about how miserable we were and can't believe how much we've grown. I think marriage is so much work and compromise and learning how the other deals with issues and making adjustments. I try to think everyday how I can make his life easier, what can I do to help him. This creates a snowball effect and makes him want to help me more. I also keep my mouth shut on more occasions than I used to and I think going to bed angry is far better than fighting a lost cause till 2am. Things are ALWAYS better in the morning. I agree! It gets so much easier as it goes and when I look back at that first year I wouldn't go back for a million bucks. I am the same with learning to keep my mouth shut and the "don't go to bed angry" advice is the worst ever. ALWAYS go to bed when you're angry- in the morning it hardly even matters! Also, I know you are an English teacher, please forgive any/all grammatical/spelling errors. I am just a lowly engineer! I like math, so writing is by far not my strong suite :) I always wondered if english teachers or writers in general got irked at others less refined writing skills. Do you find that to be true? Yay, you've been wanting to write this post for so long! One of our biggest conflicts is surprisingly how we recreate. I am a lay by the pool and read a book kind of girl. Hang around the house with my family and visit by the Christmas tree. Adam is a do-er. On our honeymoon I begged for a day where we could do nothing (we were in FIJI!!) and he said "Okay on Thursday we wont do anything, we'll just golf" and we fought about that so much that week. On the last day there I said "I am not a high energy person" and he said "How can we change that?" Never, ever, utter those words on your honeymoon!!! I know! It has seriously taken me FOREVER to finally figure out a way to write it. I am a do-er for sure and Greg is the lay around and relax type of person. That's why I almost wonder if when the babies come Greg should stay home and I should go to work- it would be much more fitting for our personalities for sure! Thank you! I would love to hear your perspective on this- I am sure I could learn so much from went right and what didn't in a past marriage- it would be such an interesting take to get on the whole issue. And thanks for always commenting- you are such a sweetheart! we are the same way with money! i've learned to compromise and also enjoy experiences and not being so crazy with money and he's definitely learned the value of saving it! Not knowing how to fight fair is such a good one! However, I'm the one that needs to retreat. My temper can get the best of me and I know I need to calm down before my husband and I can re approach the topic. Destry and I have been married a week (!!!) and so this made for a great read. You and Greg are a great example to me :) Thanks for this wonderful post! Thank you Trevor! Your comment means a lot! So sorry we couldn't make it to the wedding- I heard it was absolutely spectacular. Best of luck to you two! I think the comparison thing is one of the big dangers in marriage. I do this all the time- do we hold hands as much as they do? Do we go out as much as they do? Do we "appear" as happy? I think a lot of the security and happiness in marriage just comes from not trying to constantly be "other couples." We've had a tough 7 years together, almost 3 married and know we can make it through anything! LOVE THIS! That's almost how I feel- we can get through anything if we've successfully mastered the past! I knew going to into marriage our that I was super extroverted and he wasn't. But I still struggle with it. He loves his quiet time and his alone time, especially after work. And as soon as he gets home, I have like 500 options for what we could do that night. I think I've been learning to discern it better. And I used to just tell him we were hanging out, now I ALWAYS ask him if he wants to go over to a friend's house for games. I struggled through it for a few months but now I've learned that if I can hang out with people or get my social time in while he's at work, (although i do work part time)...I'm way less anxious at night!! As far as fighting fair.....still working on that. We are awful human beings to each other. I totally hear you on that. I could never just spring "Oh, by the way we're hanging at my brother's tonight." Would never work. The fighting fair thing takes a lot of work and time. I think that's the other thing that is frustrating- you want to see changes in your marriage immediately but some habits take months and years to break free of. love this. I def can relate to #3. I'm the same way your husband is, I just need space while my husband prefers the "let's just talk it out now and enjoy our day" approach. Took some compromise on both parts to realize where the other was coming from! This post is amazing and honest. Thank you for writing it. I think it is a great insight and I LOVE hearing from newly(ish) married couples because it is sad when people think that the reality of marriage is either rainbows and lollipops and constant obsession w'/ eachother forever or a horrible, depressing ball and chain situation. There is definitely a compromise and I think it is great that you guys work through the things that are hard and this post is great in illustrating it. Thank you! As far as the obsession thing, I read a current study that talked about how the more secure couples are in the marriage the less "obsessed" they seem because they are still able to have their individual identities and passions. It talked about the need to always be texting each other and checking up on each other as a sign of insecurity in the marriage- very interesting. i'm not married, but i thoroughly enjoyed this post. I simply loved this post. I have been married for a year and three months and I can completely relate! (glad I'm not the only one to feel this way!) Especially learning about how the other fights, who would have thought that was something you would need to learn about someone and compromise on?! I loved that the key here is compromise, cause it truly is at every corner in a marriage! YES! Sometimes I think it is totally crazy that any two people in the world have enough audacity to think they can merge two totally different lives into one. Takes a lot of work, for sure. I love this post - admitting the struggles you had AND how you handled them is so helpful. I also totally get the introvert/extrovert one. I've been married for almost five years, and the biggest hurdle I've overcome is speaking up when I feel slighted, instead of letting it fester. I would blow up one day over something "small", but that was because ten other things had been boiling in my brain, and that was the final thing that made me snap. Now when I feel something is unfair, or if I need help, or I just need something from my husband, I speak up and say so. Life is much more peaceful these days. Oh man, we don't struggle with the holding stuff in issue, but I can see how that could be so tough. We both say exactly why we feel hurt when we feel hurt which can be another issue in and of itself. Thank you so much for writing this Bonnie! You can tell it comes from a place of genuine truth. As someone who is just beginning to anticipate what issues we might have in the first year of marriage, it is helpful to read that it's not all unicorns and rainbows! I can definitely relate to these issues. I'm the introvert and my boyfriend is the extrovert. It always amazes me reading posts about marriage how much I can relate. Justin and I have been together for 6 years and live together. 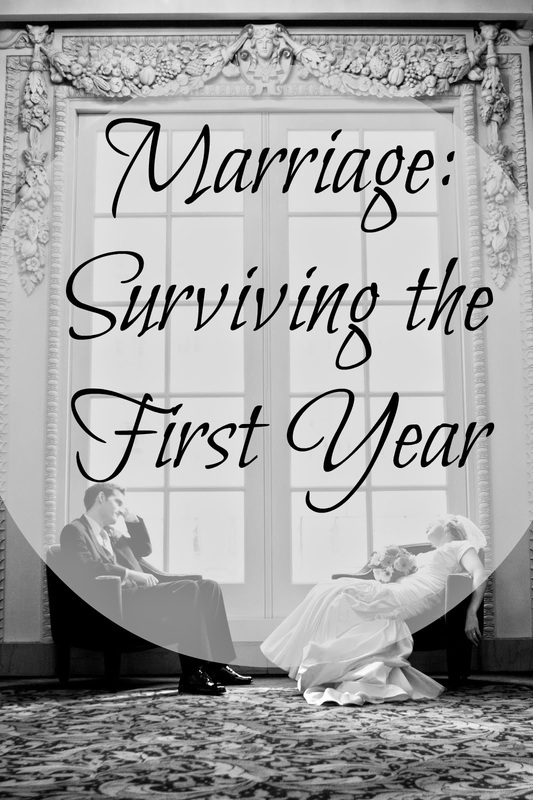 I can't relate directly to the "first year of marriage" but let me tell you, the first year of living together was similar! Good work in figuring out how the other person works through things, you guys will have a very blessed marriage if you continue caring about how to make things better for the other! I really appreciated this! My husband and I will have been married three years this summer and it is an adjustment. Even though we dated for about four years before we were married, we had never lived together so that in and of itself changed things a lot. I. Love. This. Post! My husband and I have only been married for a year and change, and our first year wasn't terribly rough as a couple, but I think we each individually went through a lot of stuff that made it difficult at times. Communication, as vague a term as it is, is always something to work on, and it's weird, but neither of us are "fighters" so we haven't had to deal with that yet. That in itself kind of scares me b/c I'm worried that one day, it'll blow up in our faces! I have a lot of anxiety about money (and... everything in life) so Ken (husband) usually is one calming me down and telling me/showing me how things will be okay. He's quite a saint. Thank you again for such a honest, wonderful, well-written post. You make me feel less alone! I always feel so rewarded for reading your blog. Thank you! I love this so much thank you for sharing!! My Fiance and I have been dating for 3 years, and we just got engaged this October planning to be married next October. Even though we'd been dating for 3 whole years, its crazy to see the sides of us that start coming out once we're engaged and getting ready to be together forever. We never ever fought before and now we argue over future decisions, wedding plans, ect. We still love each other like crazy but I'm so glad to read that a little bickering is normal. On Facebook, I can't help but always compare ourselves to other couples. I'm always wondering: How did they have money to do that? How are they always so adventurous? How do they manage the time for that? Then I start comparing my Fiance to other people, I start comparing our relationship to others and soon, I've created a whole bunch of problems out of nothing. I'm glad we get the honest truth from someone! FINALLY! An answer to all my marriage and relationship questions: No one is perfect and no relationship/marriage is perfect. It is unique, it comes with struggles and difficulties and strife. But it also comes with happiness and love and a partner who will side with you until the end, no matter how much you nag them about money (my personal favorite nagging topic). Thank you for sharing this. I think I'll ask my Fiance to read this with me next week for our "Strengthening Marriage" Themed FHE nights. (Something he came up with to help us with this painfully long engagement). And now I understand why we are the blog buddies that we are. I am the girl blogger version of Greg! Haha this is very funny to me right now. I hate parties, love staying in, spend way too much money I don't have, and could talk about dogs for hours. And I also do improv... I think it's time you met Chris. Dang girl! 48 deserved comments because this was a GREAT post. I think when you've written about budgeting before I've gotten all excited and jealous because we are exacccctly the same way. I'm a saver, he's a spender. It is almost literally painful to me to see money going on little things that I deem unnecessary while he doesn't even think about it. That one is still really hard on us, but maybe it's gotten a bit easier?? I think whenever we are hopefully out of debt I will be able to relax a lot more on that, it's just right now that seems like an eternity away. :/ And the learning how to fight. I need reactions and he barely talks about his problems. He's so private and I'm so open. And while I talk with him about this and how I need for us to try to figure things out by talking, it still is tough. He just seems to think that saying "okay" and placating me, or basically putting up a wall, will stop whatever I'm upset with when in reality it just infuriates me. I have to try to remember that too. "Tomorrow everything will be just fine. This is just a hiccup, not the end of the world." It's hard in that moment to not feel like the whole world is crashing down. Being out of debt will definitely help, but for me I'm stressed about money ALL the time because there are so many "upcoming" expenses- house, children, grad school, etc. I wonder if you can ever completely relax with money. Love this. I really relate to Greg. I am the one going into my "woman cave" when arguments arise and I spend too much at Target while Jeff has a nice saving cushion. He definitely is the introvert though. One thing I have in common with you. ;) Marriage is incredibly rewarding but it does have its challenges. Jeff and I have been together for 10 years and we are still learning how to grow and be the best for each other. But we love every moment. I can not believe that you and Jeff have been together for ten years! That is insane! You two could probably write a book by now! Haha! Thank you so much for this spell caster wisdom. I will definitely take it to heart. Oh that's weird, our first year of marriage was so easy! Just kidding! Oh my gosh I thought we were going to get divorced multiple times. We still disagree and bicker but oh my gosh it is do much better. We are coming up on five years now and I love that it gets better every year! I think we have both just mellowed out and realized most things are not a big deal in the big picture. Love that you tell it how it really is! Yes! It's all about the big picture. And I would have NEVER guessed that you and Colin struggled- you seemed so 100% perfect for each other. It just goes to show that everyone has their issues. We need to hang out more now that you are so much closer. Let's do a game night! Thanks for posting this! Sometimes marriages in blog world seem so sugar coated. I know I also struggle with the introverted vs extraverted thing and compromise is key in all areas as you say! Greg has said the same thing. If I don't give him time then he doesn't know what he wants to say and he feels like I "beat" him in the argument just because he hasn't had enough time to put his thoughts in to words. Aaaaaamen. Thank you for this. The introvert-extrovert part is really interesting to me. I'm an introvert, so I can probably relate to your husband. I'm actually probably more of a spender than a saver too (although I'd love to become better at saving). I like your honesty in this post. I think marriage is a journey and something you have to continue to put effort into. The wedding day is only the beginning. Such a great post. Thanks for writing this. So often marriage and its issues are just swept under a rug, especially in this LDS culture of ours. No one wants to talk about their dirty laundry, so none of us have a bearing on what reality is. I've been married 9 years, and if I had to pick our 4 biggest issues, they would be EXACTLY yours. (But your 1 rough year was my 3 rough years!). My biggest lesson has been in fair fighting. I want to battle it out- he needs his space and time. It took me a long time to drop my control issues when we fight. It ends better 100% of the time when I do. Anyways...just thanks for talking about this & I completely relate. Yes! I agree! I don't know if it is that way everywhere but I definitely feel like the LDS culture sugar coats it and sometiems gives off a false perception of reality. I wish they talked more in church about the sacrifices and work that must go into marriage. They do kind of vaguely but never enough to really understand what anyone is talking about. Thank you for this post. Honestly. Just had a chance to read this post and I can relate to so many things. My hubby and I are the opposite on the fighting fair - I like to be left alone for awhile to gather my thoughts. Thank you for your honesty and being open to share so much!! My boyfriend and I have been together for 5 years (finally talking about marriage and RINGS now, weeee!). I can tell you that the first three years were really difficult. We did not fight the same AT ALL. Very similar to your relationship, gender roles be damed but they fit us in this case. but now? Especially after one or two very serious, trust-bending issues? Our relationship is "perfection" (quotes understandably necessary because nothing is really ever perfect). We are always on the same page now, and I even still get butterflies when I get that kissy-face or rose emoticon via his text messages. Really! Crazy! I get butterflies over nothing after five years of dating! I am so, so happy for this post. Seriously. It makes me so happy for you. At the risk of sounding like a fourteen-year-old, I love LOVE. Having that other person in your life, and things going well, really make life a million times better. It's like floating on air. - COMMUNICATION, open and honest, as obvious as it sounds, was so so hard in the beginning. I was the QUEEN of not asking direct questions, being that awful "passive aggressor" and that drives Eric to the brink of insanity. I no longer do this to him and it's so much better. That's just a drop in the bucket of how open communication has saved us! - So grateful for this community where we women can talk about things like this. It's so good to not feel alone. Thank you for providing this outlet. These comments are truly outstanding. Oh! Oh! AND: Omg the Public Displays of Affection was another one. Eric is so anti-public kissing etc and I wld get so upset especially when we were out with other couples that were all over each other. I felt unloved. Crazy right? We have worked that out too, compromise is key. Like I said earlier, he gives me butterflies over all sorts of things now. Holy hannah I am SO GLAD this is not just us!! I totally agree...you really have to figure out how to not fight dirty. We'd been married for 17 months now (but who's counting?) and there's still things we're only just now realizing we need to work on. I think I work really hard to keep our conflict inside of our marriage, so that we are more convincing when we say how wonderful and important marriage is. But at the same time, I think marriage is wonderful and important in part BECAUSE it is dang hard. It makes you better. And...I can't help but ask...does it get easier from here? This is a great read, and my husband and I can interchange our names for yours. But if you think marriage is hard??? Wait until you have children! :) Being a PARENT is so much harder. So glad you have learned how to deal with each other's nuances now, so you can be a unified team when it comes to parenting! Thank you again and good luck! You can do it!! This is a fantastic post - thank you for being so honest. You should consider submitting your story to apracticalwedding.com - they do a lot of honest posts about marriage and the struggles of sharing your life with another person. I am in a long term relationship and I love everything about this post. MY boyfriend and I have our own money but it still bothers me when he wastes it on things that I don't think are necessary, when we get married this will be a really hard one for me! The fighting fair is a good one!! We have been together almost five years now but are still learning about this. I agree with the guy/girl thing because he always wants his space but I do notice if I give it to him then theres a good chance he will be back to talk in ten minutes. This post is perfect. I'm so awed by your honesty....and I'm so grateful to know that I'm not the only one who argues over introvert/extrovert. Andrew and I had some very serious conversations, and they all boiled down to a lack of understanding in our relationship! Wonderful advice, thank you for sharing! My husband and I are coming up on our 1 year anniversary in a few months but have been living together for six years. Like your husband, I feel a need to withdraw during an argument, reflect, calm down, and then come back ready to solve things. Ian, on the other hand, is much like you in that when there's a problem, he wants an immediate resolution. He would follow me into rooms when I left to have space, which in turn made me feel trapped. Soon we realized our differences and how we process these situations and have learned to compromise during our fights. The way I explained it to him is that sometimes I just need to be mad/sad/whatever for a while by myself. I really want to thank you for your candid honesty. I have been married for 2 months, it has been a struggle every day. It never occurred to me it would be anything other than pure marital bliss. My husband and I, until our wedding day, had incredible communication. We would talk for hours on end about anything and everything. We had conflict resolution down, we respected each other, cared for each other and generally went out of our way to please each other. We were there emotionally, mentally and physically. I never dreamed that would change or so suddenly. This post gave me hope. Thank you. We are JUST like you and your husband...only the roles are reversed. I'm just like your husband and my husband is just like you. We dated 7 years before we got married in November of last year so I knew what I was getting into when we said "I do". We still have the same issues that you're having but I know that with time things will continue to get better. Thanks for this post. I needed to read this. I am going on my second year of marriage and it's so tough. There are times I just wanna give up and reading your blog post has given me some hope. I thought him "shutting off" was only in my relationship, so thanks for your words of wisdom. I see a little bit more light now. Thank you for your article...This is my first year of marriage and I can relate to all of the issues that you mention.Your feedback and way of viewing things is so positive, I hope to apply it like you have. Congratulations! Wow- Thank you so much for your transparency and honesty talking about struggles in marriage. We just hit our 7 month of marriage mark and it is SO CHALLENGING. But what makes it so challenging is the fact that nobody talks about how hard it is so you feel like you're doing something wrong or that your marriage is a failure when in truth- everybody struggles at first! Thank you for showing me there is a light at the end of the tunnel!! haha!